This summer I’m doing an internship at Mozilla, and so far that’s the most exciting time of my life. I work in the Localization Team in Mountain View, and one of my goals is to increase the number of users on localized Firefox Nightly builds. Several projects are ramped up to reach this goal, and one of them is the Nightly firstrun page. The firstrun page is the web page you see the first time you run Nightly (makes sense, right? ), but also each time we release a new Firefox. Why do Firefox Nightly builds matter? Firefox Nightly is the earliest Firefox branch, on which all Firefox developers push their work. This build may be unstable, (but I’ve been using it as my main browser for more than 3 years, so far not that many issues). Most of the users are technical users, and they would be really valuable to the Mozilla mission if we could find an easy way to get them more involved in the project. Here comes the firstrun! Why does the firstrun page matters? This page is one of the first things we show to our technical users. The page has been simplified on purpose, to give them a clear way to get involved. 3 core areas are displayed: coding, QA, and localization. For instance, they can find a way to provide feedback to the localization team of their language, this is really helpful for localizers to get early feedback. They can even join the team! We really want users to get more involved with their local community. That’s why we don’t just get the page translated, we localized it by adding a customizable block at the bottom of the page. This allows Mozilla communities to create and publish their own content, (for instance to promote local events, IRC channel…) so that users can meet them and get involved more quickly and easily. 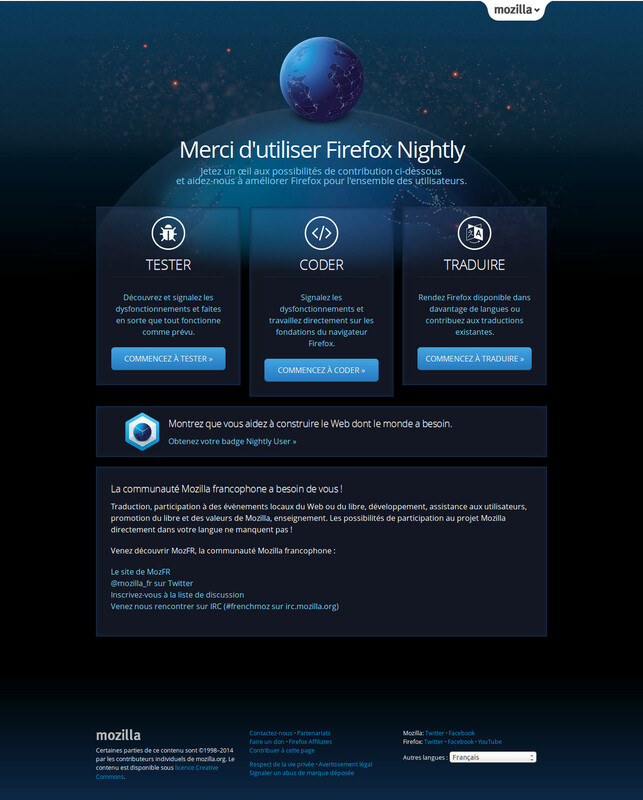 Fun fact, I was myself initially using Nightly and contributing to Firefox code before even knowing a French community existed! In order to always get relevant content, localizers can update the block as part of the general Web Localization process, so it can be done quickly and regularly, without having to ask anyone. The page has been live for a few days now, and you’ll see it if you create a new profile on Firefox Nightly, or next time Firefox team bumps up the version number. You can take a look at the per-locale customization on the French page below for instance. The page is already localized in a few locales, also we are planning to add more locales amongst Firefox Nightly locales really soon. The next step for the page will be to analyze the traffic and determine what we can improve. You too, get more involved! If you want to contribute to these areas, you can download Firefox Nightly in your language. Right now this is the only link we have to get people to download localized Firefox Nightly builds, but we plan to get them more exposed really soon by adding Firefox Nightly to the new design of the channel page. I learned a lot during this project, this was my first page for mozilla.org, and this was a fun challenge. Our Creative Team created the new design, I did the HTML/CSS code — and of course, made sure the page was l10n friendly — and the Mozilla.org dev team reviewed my work and gave me useful tips. There were a lot of things to take into account: performance, accessibility, localization, metrics, responsive design… but it was really worth it. Also, a huge thank you to Pascal Chevrel and Delphine Lebédel my mentors, and to all the Mozillians for helping me learning new things! Given that most localizations actually work on Aurora (and we have way too few Aurora testers, but not too few Nightly testers), I wonder if it wouldn’t better to direct more non-English users to Aurora for early L10n testing. Did you discuss that as well?